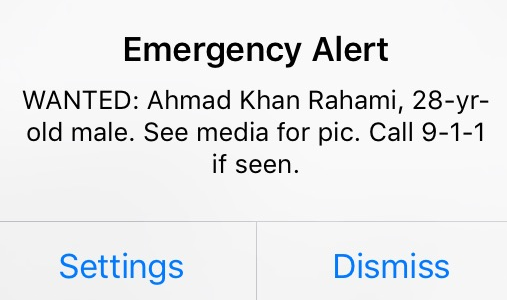 New York's Use Of Phone Alert Shines Spotlight On Wireless Emergency System : All Tech Considered "WANTED," blared New York's alert. "Ahmad Khan Rahami, 28-year-old male." This year, nonfederal authorities have sent as many wireless emergency alerts as in the previous three years put together. To millions of people in New York on Monday morning, the first word of a suspect in the New York and New Jersey bombings arrived at 8 a.m. with a jarring, screeching sound of their mobile phones. Screens lit up across New York City with an emergency alert: "WANTED: Ahmad Khan Rahami, 28-year-old male. See media for pic. Call 9-1-1 if seen." This was perhaps one of the most high-profile, large-scale uses of the wireless emergency alert system — and a relatively unconventional one. City authorities called for citizen vigilance as they searched for a bombing suspect. But the alert is also part of a growing reliance of local, state and national authorities on the phone emergency system to look for missing children, warn of extreme weather, urge to "shelter in place," organize evacuations, inform of chemical spills, and alert to impending power or water outages. So far this year, nonfederal authorities have already sent as many wireless emergency messages as they did in all the previous three years since the program's nationwide launch in 2012, says Wade Witmer, deputy director of the Integrated Public Alert and Warning System program management office at the Federal Emergency Management Agency. The current 1,200 alerting authorities include county sheriffs, local and state public safety and emergency management agencies, city and tribal governments, military bases, police and fire departments. FEMA reviews applications to become an alerting authority and serves as the conduit to the wireless networks, though it does not review individual messages, Witmer says. A local or state authority would typically initiate a nonweather alert, and through a secured computer network, FEMA connects them to wireless carriers. Phone companies push out the message to the geographic areas selected by the authorities by using specific cell towers in that area. "It is like a text message, but it's not a text message — it uses a different channel on the carrier networks," says Brian Josef, assistant vice president for regulatory affairs at the wireless trade group CTIA. This way, the mass alerts don't congest the airwaves. -- Presidential messages during a national emergency. The latter category has never been used, though it was the key trigger for the creation of the system. Cellphone alerting is a modern addition to the Emergency Alert System, a TV and radio warning program that spawned from the Emergency Broadcast System, which in turn replaced CONELRAD — a 1950s emergency radio system meant to warn of a potential attack during the Cold War. The presidential alarm is the only one that smartphone users can't disable on their phones. Today, the National Weather Service remains a big user of the wireless alerting system, Witmer says. The siren-like sound is probably familiar to anyone in areas that get tornado, hurricane, blizzard or flash flood warnings. But the alerts have also been used to urge people to "shelter in place" during active shooter situations, to evacuate during brush fires or to boil water before consumption during a water main break. "We've seen other areas across the country use it to describe a suspect that they were looking for or a dangerous person," Witmer says. The wireless Amber Alerts have also been credited in rescues of several missing children, including a 7-month-old whose abduction in 2013 triggered phone alarms to blare across New York City before 4 a.m. In New York early Sunday, city officials issued a wireless alert — through their Notify NYC program — to people in the direct vicinity of the exploded bomb in the Chelsea neighborhood, warning them of a second "suspicious package" and telling them to "stay away from windows." An update later informed people in the area that the bomb was safely removed. The "WANTED" message during the suspect search on Monday was ultimately praised by Mayor Bill de Blasio as a "very valuable tool" that "created a lot of focus and urgency" and "definitely contributed" to the capture of the bombing suspect. But the alert also drew criticism for its mass scale and vagueness in describing the man only by his age and name, "Ahmad Khan Rahami." The reason why the phone messages often seem short-handed is because they're restricted to 90 characters — less than two-thirds of a tweet — a vestige of the tech limitations at the system's origin. "When the technology was developed, that was the state of the maximum capacity of the messages, including routing information," CTIA's Josef says. The system for now can't send photos or video either. "That's not something where there's the capability today," Josef says. Both may change in the future. The industry is already working with regulators to increase the character limits, Josef says, and "discussions are underway" on including multimedia.